I'm really pleased to let you know that we have a new Bondville sponsor that holds such similar values to our own. Children's online clothing boutique Ele-ahbaant focuses on ethical (sweatshop-free) and environmentally friendly clothing, and Australian designers. You can't really go wrong! 1. Miatom Caravan Long Sleeve Tee - cool retro caravan design that is sure to turn heads. 2. Olli & Lime George Sleepsack - possibly the chicest sleep sack ever. 3. Daily Tea Bulldog Long Sleeve Tee - minimalist doggy cool. Please stop by and check out the gorgeous selection of clothes and accessories for boys and girls. 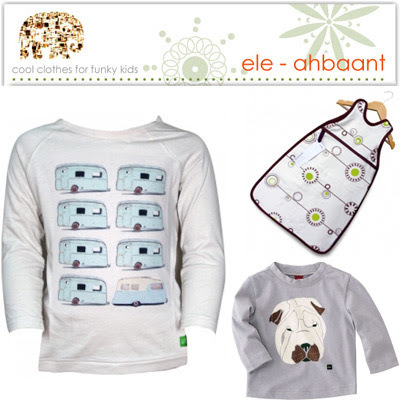 You can read more about Ele-ahbaant's own label here on Bondville Kids. Hi Christine - glad you like! And you're very welcome. Will definitely pop by tomorrow; see you there.